Place a glass or metal mixing bowl and the mixer paddles into the refrigerator for 5-10 minutes. Using a stand mixer or a hand mixer, whip heavy cream on high speed until it forms stiff peaks. Place the bowl of whipped cream into the refrigerator. In another bowl, using a stand mixer or hand mixer, beat cream cheese, lemon curd, and lemon juice until fully blended. Sift the confectioners sugar into the lemon cream cheese mixture and beat on medium until fully mixed. Using a rubber spatula, gently fold the cold whipped cream into the lemon cream cheese mixture until it is fully incorporated. 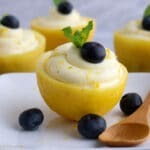 Place the cheesecake mousse into a piping bag (with a large tip) or a large zip-top bag (with a small corner cut off the tip) and pipe mousse into the lemon cups or small dessert glasses. Top with fresh blueberries and fresh mint.